Located in the beautiful Crystal Beach community, just across the street from the sugar white sands and emerald waters of the Gulf of Mexico. If you have not been to Destin, then you are in for a treat. The water is crystal clear with a breathtaking emerald color. Our well maintained condominium is on the first floor with a partial view of the Gulf. Whether in the living room or on the patio you can look out at the gorgeous emerald water. The pool, whirlpool and barbecue area are just steps away from our door. Beach access is right across the street. The large master bedroom, with new queen size bed, has a separate entry into the spacious bathroom, which has a Jacuzzi tub. The kitchen is bright, roomy and fully equipped. Bunk beds are built into the hall and a sleeper sofa is included to accommodate additional guests. Also included in the unit for your convenience is a washer and dryer and internet access, all with free, unlimited use. But don't take our word for it, see the guest comments link below. There you will find why our guests return every year to vacation with us. 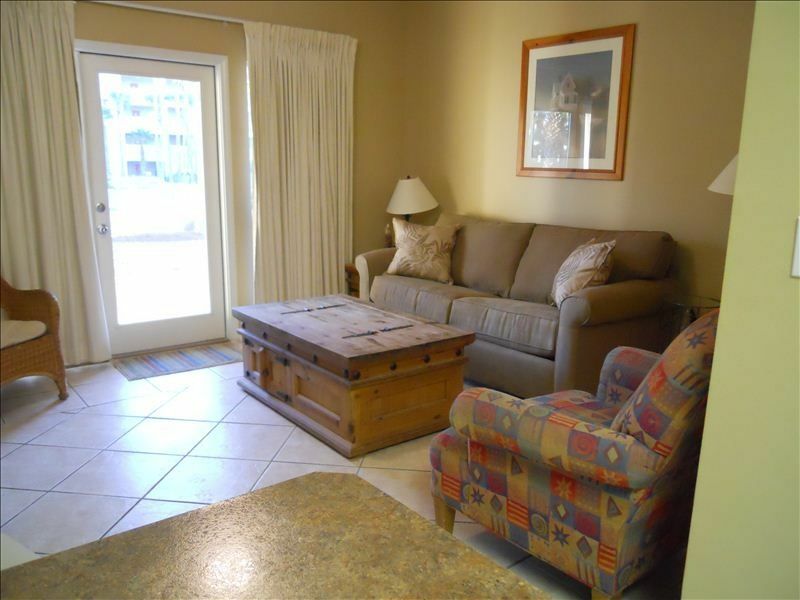 Our Caribbean Dunes condominium is our family vacation home. You deal with us, the owners, not a management company. We are the longest serving 'by owner' vacation rental in Caribbean Dunes, since 2002. Married in 1984, owning a condo at the beach has been our dream since the honeymoon. Now this condo has become our family retreat. Our children and grandchildren will always have their memories of the McCorkle family beach vacations. Since we began renting our condo out in 2002 we have truly been blessed with great customers. Most of our renters are repeat guests who treat our unit as their family retreat. We chose Destin because of the beautiful beaches and the wholesome, family atmosphere. This is a wonderful place and a great environment to take children and granchildren. With the pool 60 feet from our door and the beach 100 yards away, it is easy to relax. A full kitchen makes it easy to eat in and the laundry in the condo means you can pack light. We also have unlimited wireless internet, which is great so you can check e-mails while enjoying coffee on the porch. Unlimited WiFi at no charge to you. All towels besides beach towels.